Includes: 2 night stay at the Great Wolf Lodge in Grapevine. All sessions, scheduled meals, snacks and offsite activities are included. Alcohol is not included. There is plenty for your companion to do and see while you're attending the conference. Grapevine CVB can help with the sightseeing planning. This price includes meals and attending any offsite functions with the group. No lodging at Great Wolf Lodge. Already just registered and need to pay? Click here to jump to pay now button! Want the old fashioned download and print version? Click on the brochure image below or just Click here! The conference begins on Wednesday October 24, and concludes on Friday October 26. 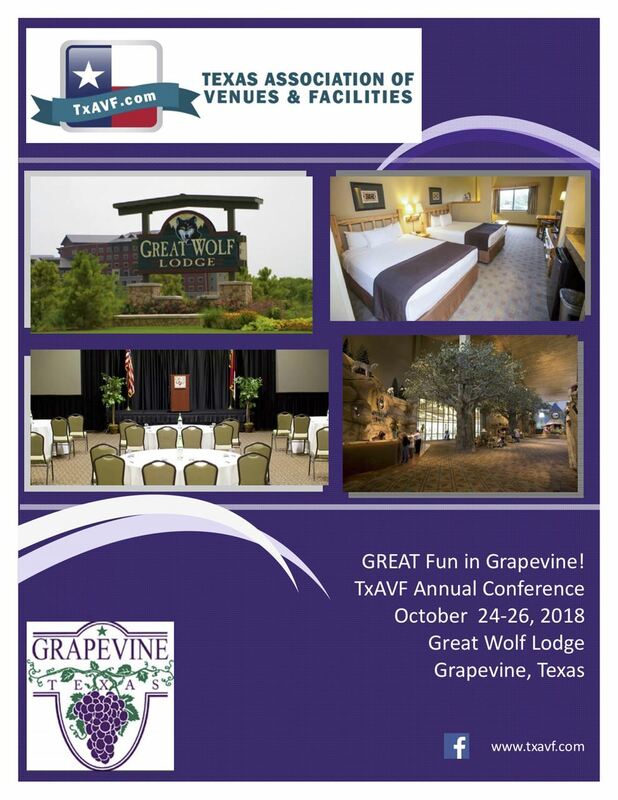 Registration fees cover all session, meals, snacks and lodging at The Great Wolf Lodge in Grapevine. And there's a bonus this year! The Great Wolf Lodge has extended the discounted rate for either up to three days prior to the conference or up to three days after the conference if you want to enjoy time with your family. Be sure to mark on the registration form if you're interested in taking advantage of this offer!